almotamar.net - Director of the Yemen National Museum announced Sunday that the number of antiquity pieces the Museum houses up to this month amounts to 30 thousand antiquities and manuscripts. Museum Director Abdulaziz al-Jindari says those antiques represent pre-Islam and post-Islam historical epochs, some of them date back to vary ancient eras. They represent very great archaeological value and some of them date back to periods of Yemeni city states established since the era of Sheba Kingdom and they almost represent a complete history of Yemen. 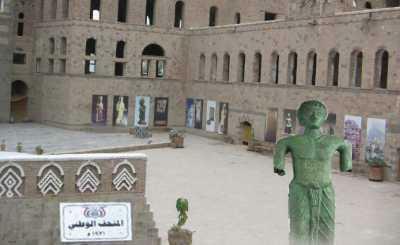 Al-Jindari told almotamar.net that the Museum administration received during this year 6 thousand antiquities, pointing out that the Museum has become an important centre for attar\acting foreign tourists visiting Yemen due to its exhibits of historical and tourist value.